Mercedes-Benz has offered the world a look at its all-electric EQC, set to debut in Stockholm, Sweden on September fourth. The electric SUV has been in progress for a long time and will be the principal vehicle in the marque's EQ range to achieve showrooms. The German producer has been shockingly open with the vehicle's advancement lately, offering us a large group of pictures and recordings of models testing the world over. 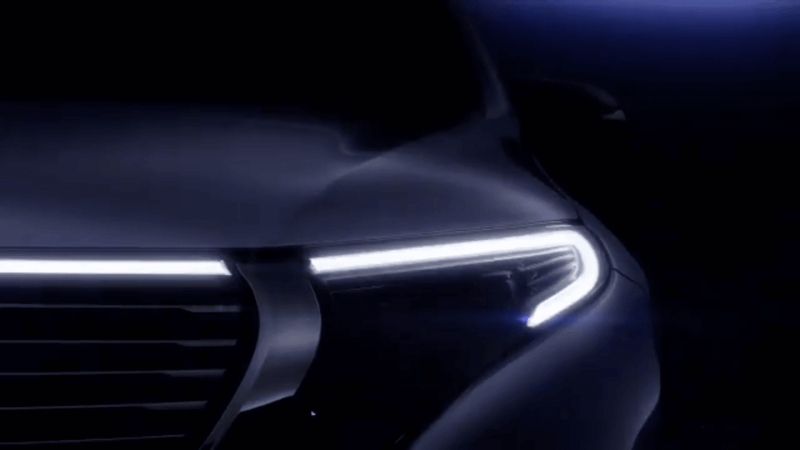 This teaser video from Twitter offers a look at the vehicle's front fascia with no disguise constraining the view. The most interesting outline component of the EQC will be the LED daytime running lights that stretch around the outside edge of the headlights and are associated with a horizontal LED stripe straightforwardly over the front grille. Amid an ongoing public statement itemizing the vehicle's development, Mercedes-Benz uncovered that it has been trying 90 models and 30 pre-production models, covering a huge number of kilometers of true testing on four unique mainlands. Mercedes has stayed shy on the EQC's specifications, yet the Generation EQ concept, on which the EQC is based, landed with a couple of electric motors conveying a joined 402 HPand 516 lb-ft (700 NM) of torque. Driving these motors was a 70 kWh lithium-ion battery pack offering a scope of up to 310 miles (500 km).